Patch has great stuff but also a whole bunch of new stupid bugs or “features” (new Elysian chests drop loot but this never appears in your inventory until you restart the entire game…). Probably the first time in a while I felt disappointed about a patch. Ugh…well that sounds pretty crappy hope they hotfix that asap. The GM2/3 thing exacerbates this, as they’re there, but don’t give enough of the highest tier items to really justify themselves. If you run a GM2, you should basically only ever be getting MW-tier items I think (drop total number of chest rewards if you have to to achieve this), and for GM3 you should be guaranteed a single Legendary. There is enough gear and weapons and the inscriptions are varied enough that I really think you could flesh out long-term enjoyment from a system that generous. I think this Stronghold will be quite difficult on GM2. It’s got puzzles and some sections that are very clearly designed for teamwork (you’ll know it when you see it). But it is a ton of fun on GM1 - they’re really not pulling any punches on the numbers and types of enemies they’re regrowing at you! It’s like finishing a 41 ounce bag of Skittles and I’m down to my last few. I’m going to eat this one slowly and hope I don’t drop it. I was a bit surprised to be killed so easily on GM2 as I was playing Colossus with quite some good defensive stats. Anyway, I need to look at my weapon loadout again as well because I was doing less damage than expected on my initial run despite toting Legendaries. I might need to go with another Javelin as my Colossus was a sitting duck at times…too slow. Rangers’ maneuverability or speed of the Interceptor seemed to give better chances for survival. For GM2 I generally use a “stat stick” weapon that buffs my armor, along with some form of life giving gear or components. 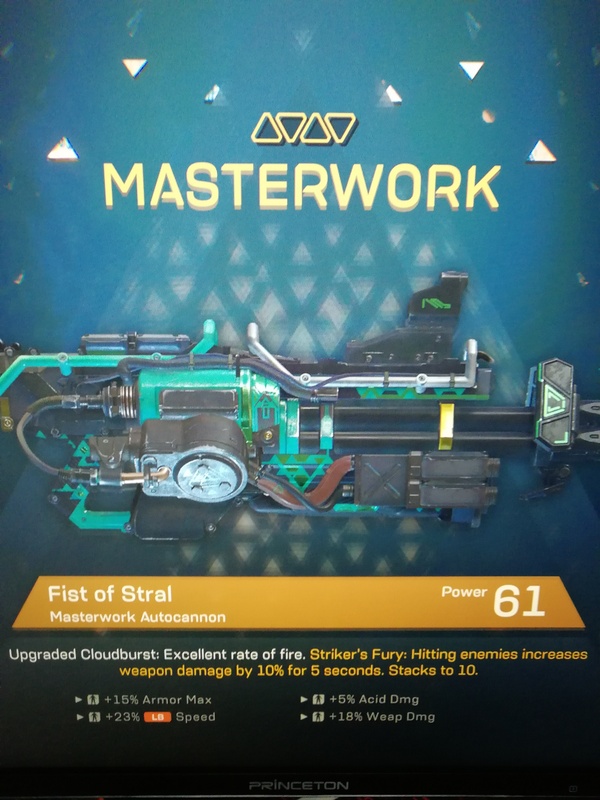 My legendary Devastator has a 90% armor buff, for instance, while one of my machine pistols has two different max armor buffs that total 150% or something like that. Damage in GM2 is pretty hard to come by with the weapons anyway (melees and combos seem to be the bigger damage dealers), so I don’t think you lose much by not having an offensive god-roll weapon in your loadout. I do have a DPS build that lets me get like 260,000 dmg per devastator shot, but I found that build wound up relying a fair bit on hanging back - didn’t have near enough health or normal damage to really get in there and mix it up within strongholds. Freeplay is fine, but the stronghold enemies are just way too beefy to take on at close range with only weapon and wraith strike damage. I tend to focus on buffing L1 / R1 recharge speeds or damage increases on eg. ordinance launcher, so I tend to not focus on beefing up armor and shields. I probably could compensate this by equipping consumables but I always forget the darn things.